SEOUL—In one of the biggest global recalls of smartphones, Samsung Electronics Co. said it would replace Galaxy Note 7 devices because of reports of battery fires, dealing a blow to the company’s recovery efforts. The recall is also painful for Samsung because it tarnishes its image ahead of the introduction next week of Apple Inc.’s next-generation smartphones. Samsung has accelerated the launch of its new phones in recent years to get a head-start on Apple. Samsung, the world’s biggest smartphone maker by shipments has been relying on its Galaxy phones to drive the recovery of its mobile business, which has been struggling for more than two years amid strong competition from Apple and Chinese rivals. Strong sales of the smaller flagship Galaxy S7 phone had helped make the three months ended June Samsung’s most profitable quarter in nearly two years. At 16%, the company’s mobile profit margin was the highest since 2014. Samsung said reservations and prepayments for the large-screen Galaxy Note 7 were higher than for previous Galaxy phones. The official said Samsung had registered 35 cases of the problem in phones globally through its service centers and estimated that 24 phones in each batch of one million produced were faulty. Consumers can also get a full refund for the device, he said. Samsung’s exchange program will be in effect in all 10 countries where the device has been sold. The company said it would take roughly two weeks to replace the phones given supply issues. Samsung went ahead with the release of the Galaxy Note 7 in China on Sept. 1 because batteries in phones sold there came from a nonfaulty supplier, Mr. Koh said, adding that there is only one battery supplier for each country. Concerns about the phone began when social-media sites carried photos and videos of scorched phones, with users saying they had caught fire or exploded while charging. 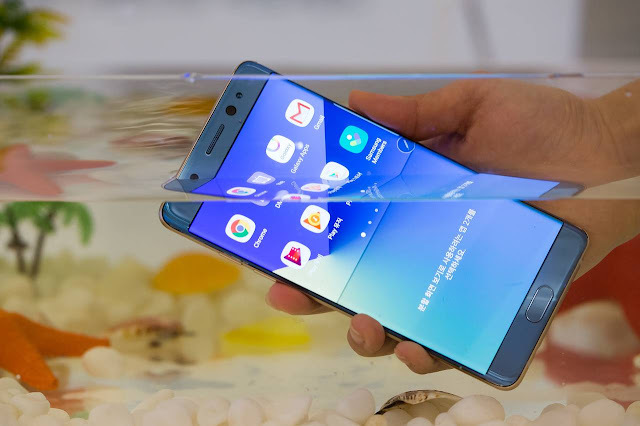 On Wednesday, Samsung confirmed it had suspended shipments in South Korea of the large-screen, waterproof Galaxy Note 7 to conduct additional quality tests. Major Australian carriers confirmed the phone had been withdrawn from sale there on Friday. Samsung said it would provide details of the exchange program for the phone by country later. Mr. Koh said that Samsung is in talks with vendors from various countries to come up with individual plans. Galaxy Note 7 devices can be exchanged in South Korea starting Sept. 19. Starting Saturday, Samsung will roll out a battery-monitoring service for Galaxy Note 7 users in South Korea to ensure that their devices are safe. Samsung said it is unloading devices from cargo shipments and plans to send back stocks already delivered abroad. The company said it hasn’t decided what to do with the turned in devices, but added that it would follow local regulations in each country. Samsung shares fell 2% on Thursday in the wake of reports of problems with the phone during charging but closed up 0.6% on Friday. Samsung isn’t the first smartphone maker to run into battery-safety issues. Apple earlier this year recalled adapters sold in Europe and other regions, citing a dozen cases in which they had delivered electric shocks. In 2013, China state media reported that the death of a 23-year-old woman was caused by electrocution when she answered a call on her iPhone as it was connected to a non-Apple charger. Apple launched a charger trade-in program. In 2007, Finnish mobile handset firm Nokia Corp. recalled its cellphones after receiving reports of around 100 incidents of batteries overheating from a batch of 46 million. —Rob Taylor in Canberra, Australia, and Eva Dou in Beijing contributed to this article. Samsung said it found 35 cases of a battery problem in phones globally. An earlier version of this article incorrectly stated that it found 35 cases in South Korea.